Yesterday, as I ran errands with my youngest son, we popped briefly into a Trader Joes in an unsuccessful attempt to locate vegetarian "meatballs." They were out, so we hoofed it out of the store and into the bitter cold. Just past the sliding doors, we passed an older man with a long salt and pepper beard. He was dressed in a messy melange of ragged winter clothes, and seemed to be wielding some sort of tattered banner. "CRUCIFIED!" His shout rang out across the parking lot. "You CRUCIFY me! AaaHaH! You know! AaaaHaH!" He grew silent, but paced and waved his arms about in an agitated way, flapping the banner, which had incoherent and smeared lettering on it. "Was he drunk, Dad?" asked the little guy, as we walked further into the parking lot. "Or just mad?" So I talked to him for a little bit about mental illness, and how our society really has no effective way of dealing with those who live with mental illness. That reality was driven home, again, through the tragic shootings in Tucson this week. There is, of course, much hand-wringing about how the poisonous and irresponsibly inflammatory rhetoric of the right wing could lead to violence against moderates like Congresswoman Giffords. I do think this will...at least briefly...chasten the rabblejabberers, in much the same way that the Oklahoma City bombing shut the mouths of the Angry White Men in the mid-1990s. But the reality is that the young man who opened fire...or rather, the "shooter," as we call that regularly recurring character in American culture...was not motivated by the political ideology of the right. Within twenty minutes of the shooting, as the name of the Shooter was released, I was at my computer, googling him. Before it got taken down and before his name was seized by purveyors of malware, I checked out his YouTube videos, and read the comments he'd left on others MySpace. Though I have no love for the Tea Party, this tragedy was not the work of a right-wing hyperpartisan. His writings are clearly the work of a schizophrenic. As details of his life come to light, it's strikingly familiar. He was increasingly erratic. He was viewed with fear by his classmates. He was disruptive. Everyone he came into contact with knew there was something wrong. But our culture no longer has institutions where schizophrenics can be cared for on a long-term basis. Back in the Reagan era, they were defunded and shut down. Government, you remember, is always bad. So folks in the 1980s ran with the idea that care for the mentally ill wasn't government's business and that local communities and charities should pick up the slack. But after the institutions closed, the next stage never happened. The network of community group homes that were supposed to take the place of the big state mental institutions never materialized. We didn't want to pay for them...'cause that would have meant taxes. And for all the talk of community institutions taking the place of government, mostly what communities care about when it comes to the mentally ill is making sure that they aren't anywhere near us. What about the children, we cry! And our property values, we shout! America is just not interested in providing the mentally ill with easy access to care and support. 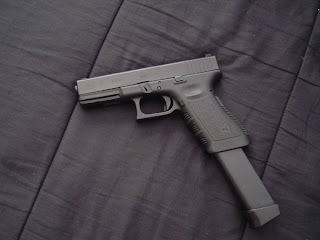 What we provide them instead is easy access to Glock 9 MM pistols with extended 30 round clips. We are a very strange country.